The medical imaging industry is undergoing a dramatic transformation driven by two technology trends: Artificial Intelligence and software-defined solutions which are changing the medical imaging workflow and capacity in ways unseen in prior years. Artificial Intelligence, specifically deep learning, demonstrates great potential within radiology for disease detection, localization, and classification. It has already shown it can augment humans by increasing their efficiency and effectiveness by prioritizing the most severe or time sensitive cases. These efficiencies save hospital systems time and money, focusing valuable resources on saving lives. Deep learning research in the field of medical imaging is booming. However, most of this research today exists in isolation and with limited datasets. This leads to overly simplified and unscalable models which only have high accuracy for a certain demographic and set of imaging devices. At the same time, smaller hospitals are deprived of the opportunity to provide higher quality of care for their local population due to a lack of technical expertise, resources, and the sheer data volumes required for deep learning. The Clara Platform addresses these challenges by lowering the bar to adopting AI in clinical workflows development. The Clara Train SDK provides Transfer Learning and AI assisted Annotation capabilities, enabling faster data annotation and adaptation of a neural network from source domain to a target domain. Once a quality-assured neural network becomes available, the Clara Deploy SDK provides the framework and tools required to define an application workflow based on the algorithm developed/adapted during the Training phase. The Clara Deploy SDK provides an industry-standard, container-based development and deployment framework for building AI-accelerated medical imaging workflows. The SDK uses Kubernetes under the hood, enabling developers and data scientists the ability to define a multi-staged container based pipeline. This modular architecture, shown in figure 1, allows developers to use the offerings of the platform out-of-the-box with minimal customization or create customized workflow pipelines with bring-your-own algorithms. Pipeline Manager and Core Services: Provides container based orchestration, resource management & services for TensorRT based inference and Rendered Images Streaming. Sample Deployment Workflows: Includes capabilities to define and configure container based workflows using sample workflow with user defined data or modified with user-defined-AI algorithms. The diagram in figure 2 shows how the different pieces of Clara Deploy framework come together to deliver end-end capabilities for data scientists and developers to build applications for AI assisted clinical workflows that work within the hospital ecosystem and scale. DICOM Adapter is the imaging data interface to Clara Deploy. It implements the necessary DICOM services for interoperability between Clara Deploy and other medical devices and software, allowing it to receive and send DICOM objects using standard DICOM protocols. Places the DICOM data into a payload suitable for an AI workflow trigger through Clara Core container. This requires setting up the the right DICOM and workflow configuration files. The Clara Deploy SDK provides configuration files that simplify DICOM Adapter deployment by specifying DICOM Configuration and Workflow parameters. These abstracted configuration files are essential for defining the Clara Deploy workflows. They include parameters required for communicating to Pipeline Manager which DICOM study is attached to which of the specific reference or user-defined workflows. Clara Deploy includes tools that convert the user defined workflow configuration into necessary formats required for Kubernetes Helm. The Clara Core container. Manages the workflow and spins up and down the necessary containers needed by the workflow. The user-defined AI containers and all containers in a workflow access the capabilities of the core through the Clara Workflow Driver, described below. The Clara Workflow Driver (WFD). This is a library to be included as part of your workflow stage’s worker process, and is an essential piece of workflow orchestration. The communication to this module is abstracted via Workflow Driver Client APIs, described below. Workflow Driver migrates research code into multi-stage production environments. Workflow Driver Client API. Provides integration for containers that need exist as part of a workflow. The API delivers the signaling towards Clara Core and between containers, passing the work forward within a workflow from container to container. The API also supports “publishing a study” which in turn invokes TensorRT Inference Server. NVIDIA TensorRT. A platform for high-performance deep learning inference. Clara Deploy leverages TensorRT Inference server (TRTIS) as a core capability to ensure optimized inferencing across defined workflows. Clara Render Server (RS). Provides visualization of medical data. Render Server supports different rendering algorithms and a platform to allow developers to create their own renderers and plug them into Render Server. The input to Render Server consists of 3D volume data or 2D image data along with the parameters which determine how to render the data. The output of Render Server can be an encoded video stream or single images, thus enabling streaming of output on a remote client. Clara Deploy SDK includes sample workflows, developers can leverage these workflows with their local DICOM data or use these as examples to define new workflows. DICOM Read. The DICOM Reader converts DICOM files into the specific file type that the rest of the workflow needs. The Clara Reference workflow uses MHD files. The DICOM Read container that ships with Clara Reference Workflow converts DICOM series into a single MHD file. DICOM files associat with a DICOM series by the Series Instance UID header. AI Reference container. This container provides an example implementation of multi-organ segmentation on abdominal CT. It requires TensorRT Inference server and is an example to show how data scientists/developers can use this AI capability as is with their domain specific DICOM data or use this workflow as an example to define new workflows with bring-your-own AI container. It is required in the case of developing a new workflow to make the associated containers compatible with the workflow driver & update the config files accordingly. DICOM Write. The Dicom Writer container is the last container in a workflow. It reads MHD files from the previous container(s) and outputs DICOM files. One or more DICOM files is created for each MHD file. Dashboard Container NVIDIA Clara Deploy supports viewing system status through a web-based dashboard that makes it easy for administrators to see how the system is performing. Clara also supports rendering of specific kinds of study data as 3D visualizations through the same web-based interface. While workflow jobs do not have direct access to the visualization services, they can publish study data to the provided Render Server. Let’s look at an example walk-through of defining and creating a sample workflow. Clara Deploy SDK includes a command line tool, clara-wf [ ]. Developers can use this tool to define a workflow, helm chart creation/update for a new or existing containers, and testing workflows locally. workflow ID. Workflow id is created manually and is configured with dicom-server config file. name. User defined workflow name. This name is used in dicom-server configuration. stages. Containers used in the workflow. Sequence of the containers under “stages” defines the sequence in which containers are used in the workflow. waitlocks. Dependency of each stage on other stages. Lock files are automatically generated based on stage name. ioFolders. Input of each stage in the workflow. Last entry is the output of the last stage of the workflow. The result in the last entry is send to a DICOM destination. args. Command line arguments supported for this workflow and defined in the helm chart for the container. Arguments and its value is written within double quotes and it is picked up for execution at runtime. Let’s now take a look at how Helm charts for user defined containers can be created. Locate container specific fields under stages: section. Verify the key value pairs are same as defined by the user container, otherwise update it manually. Workflow creation steps. Let’s assume the developer wants to create a workflow with dicom-reader container, user-ai container, and dicom-writer container. The name of the workflow is user-workflow. The dicom-reader and dicom-writer containers are provided by Clara Deploy SDK; the user-ai container is a user-created AI container. user-ai container must be updated with clara workflow driver callbacks. By default, dicom-reader container and dicom-writer container are updated with clara workflow driver callbacks. For additional details refer to section 6.2 of Clara Deploy SDK Documentation. Ensure container specific helm details are generated for each container and is present under stage: in clara-reference-workflow/charts/clara-workflow/values.yaml. Verify the correctness of each container specific key-value details. Generate the workflow ID. Executing cat /proc/sys/kernel/random/uuid on the command prompt will result in an ID, that can be used for a new workflow. Add the workflow ID, name (user-workflow), stages in the workflow, waitLocks for each stage, ioFolders for each stage, and any desired arguments to be passed for the container(s). Optionally the config details below can be used. New workflow with ID 7b413e24-d018-4689-8c41-73272f6649d4 is created. user-ai container waits on dicom-reader.lock file and dicom-writer waits on user-ai.lock file. Note: The random workflow ID can be used only for one workflow, for any other new workflow a new ID must be created. Locate the dicom data to be used in the workflow and send it to dicom server. Dicom server must be configured in clara-platform/files/dicom-server-config.yaml file. Navigate to clara-platform/files folder and open dicom-server-config.yaml. 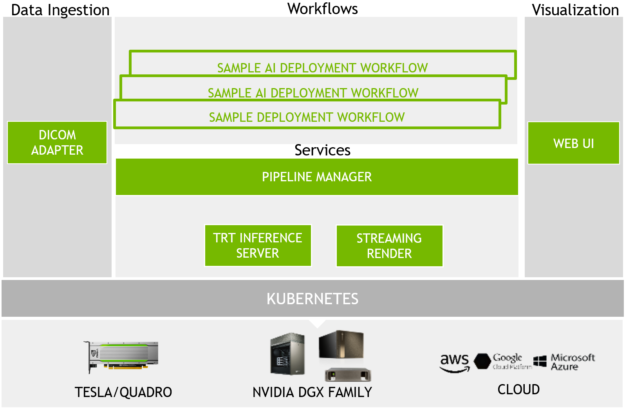 The Clara Deploy SDK open beta has been released at GTC’2019. You can download the SDK here We would like to hear your feedback and to engage on the latest developments please join the Clara Deploy Forum. You can find additional resources in the Clara Train SDK developer post. Risto Haukioja is the Director of Engineering for Healthcare Software. Risto is leading the Clara Platform engineering team team responsible for scaling and productizing AI Software for Medical Imaging and has a deep personal interest in bringing AI technology to help medical professionals provide better care. Risto has a long history technology companies, having co-founded three software companies to working with large scale enterprise systems at Hewlett Packard in Europe and in the US. Risto holds a Master’s degree from Aalto University in Helsinki Finland. Prerna Dogral is a Technical Marketing Manager for Healthcare at NVIDIA. Prerna drives product go-to-markets and leads developer engagement initiatives for Medical Imaging customers. Prior to joining NVIDIA, Prerna worked as a Senior Graphics Software Engineer at Intel for 5 years. Prerna holds an MS in Computer Engineering from University of Florida, Gainesville. Chris Scotto DiVetta is a Senior Product Manager for Healthcare at NVIDIA, where he leads the Clara platform, focused on enabling developers to transform the medical imaging industry with technology for high performance computing, advanced visualization, and artificial intelligence. He has worked in medical imaging industry for 14 years. Chris holds a MBA and Computer Engineering degree from the University of Wisconsin - Madison.